Yes, we are licensed in Florida as a lodging provider and each home is licensed by the state, the city and the county to be rented as a short term rental property. Q. WHAT IS THE DIFFERENCE BETWEEN RENTING FROM A PROFESSIONAL VACATION RENTAL MANAGEMENT COMPANY VERSUS RENTING FROM A HOMEOWNER? Emergency contact to call 24 hours a day, seven days a week, for any questions, maintenance issues and more. Familiarities like bath toiletries, fresh linens, concierge services, access to fitness centers and more. Amenities like private swimming pools/spas, fully equipped kitchens, billiard rooms, in-home movie theaters with DVD rentals, Chefs, etc. Standard business and payment procedures. Immediate online availability and confirmations. Last-minute availability for short notice bookings. Readily accessible numbers to connect travelers with vacation rental specialists. Q. DO YOU OFFER SERVICES OTHER THAN LODGING? Q. HOW CLOSE ARE THE HOMES FROM THE ATTRACTIONS AREA? All TBVH’s vacation homes are within 7.2 miles of Walt Disney World® and close to other theme parks, restaurants, shopping and outlets. The driving time is between 10 to 20 minutes from Disney depending on traffic.We have a customized guide map to better help you to visualize the location of the resorts and main attractions. Feel free to check it out anytime you want! TBVH POINTS OF INTEREST MAP! Q. IS THERE SHOPPING AREAS NEARBY? Yes, all of our homes are located conveniently close to grocery stores, drug stores, retail shops, local eateries and national restaurant chains. You can always check our customized guide map, with locations and suggestions of the main attraction, restaurants and stores in the Orlando area is: TBVH POINTS OF INTEREST MAP! Q. IS THERE TRANSPORTATION TO THE THEME PARKS? Please, contact our Guest Services Team at +1 (407) 961.6700 to discuss the options available for your vacation home destination. Q. WHERE ARE THE VACATION RENTALS LOCATED? WILL THERE BE OTHER VACATIONERS AROUND? While some vacation rentals offer seclusion, they are sometimes concentrated into various vacation rental or tourism communities, allowing guests with large groups to stay nearby or even next door to one another. Some communities are gated for additional privacy. Travelers can certainly expect to see other vacationers in the same neighborhood, and may even stay nearby to permanent residents. Q. ARE THERE VACATION HOMES AVAILABLE NEAR UNIVERSAL STUDIOS OR INTERNATIONAL DRIVE AREA? According to Florida laws, Vacation Homes (short term rentals) with less than 6 months stays are NOT allowed in this area. However, we do have some hotels options available if you prefer! Contact our Guest Services Team at +1 (407) 961.6700 for more information. Q. DO I NEED A CONFIRMATION LETTER TO ENTER THE RESORT? Some Resorts may request a booking confirmation to allow your entrance. TBVH will provide you with a rental confirmation letter at check in to allow you to enter the resort. The security guards will need to see this confirmation along with your valid photo ID (passport or Driver’s License). After confirming these two documents, they will then issue you a parking pass which you will place inside your car. Q. DO I HAVE ACCESS TO ALL OF THE AMENITIES IN THE RESORT? Yes! During all of your stay, you will have fully access to the resorts amenities, which vary from resort to resort. Pools, spas, sports courts, lakes, business room, store, cinema/movie Theater and many other options. In our Welcome Folder you will find all the information regarding your Resort and their business hours, contact information and a list of all amenities available to you. Including some special activities for children. Q. IF I STAY IN A VACATION HOME, BY MYSELF, WITHOUT THE SERVICE AND ASSISTANCE I’D GET IN A HOTEL. IS THAT RIGHT? No. TBVH prides itself in world-class guest service. At your check in, we’ll provide some important information to you, answer your questions and offer some friendly theme park/sight-seeing advice. And we’re always available if you need help, have questions, or something breaks — we have a full-time staff a few minutes away, in Orlando, FL. We’re also well connected throughout Central Florida, allowing us to provide you with discount tickets to many attractions and venues. In a sense, staying in a vacation home is like living at home, but with an offsite concierge — you stock your own fridge with what you want, buy your own drinks, do your own laundry, have your privacy — but you have help when you need it. It’s the best of both worlds! Q. IS THE VACATION HOME I SEE ON THE INTERNET AND PHOTOS THE EXACT ONE I GET? Yes, unlike most vacation rental companies, we rent the specific property you see in full detail on our website. We believe that this is the best way to ensure you will be happy with your accommodations. When you find the vacation home of your choice, you can either reserve the property online or speak with a member of our Reservations Team at 1-407-961-6700. When making your reservation, all we require is a $350 down payment that is a non-refundable, which is applied to your rental cost. The remaining balance is processed only at your check-in and will be non-refundable at that point. Guests are welcome to make payments with the following credit cards: VISA, MASTERCARD , AMEX or DISCOVERY. We also accept cash or a wire transfer at any time prior to the check in date. Q. WHEN IS THE CHECK IN AND CHECK OUT TIMES? Check-in time is after 4 p.m. Since we want to ensure everything is in good working order to make your stay enjoyable, please note that you will have access to your property at that time. Again, to ensure that everything is pleasant and enjoyable for those arriving after your departure, we ask that you please depart the property before 11 a.m. Upon request, an early check-in or a late check out, may be arranged based on availability. An additional fee of half the nightly rate will apply to receive an early check-in/ late check out to guarantee availability. Our office hours are from 9 a.m. to 5 p. m., Monday through Friday. Q. WHAT IS THE ACCIDENTAL DAMAGE PROTECTION FEE? There is an Accidental Damage Protection Fee included on each reservation. The Protection is a damage waiver that will cover accidental damages up to $1,500.00. That way we can safeguard and preserve the integrity of the rental for the guest and for the home owner. All accidental damage must be reported before the check-out time, otherwise the damage will be considered negligence. Please be advised that intentional damage or gross negligence will result in additional costs for the guest. You can always refer to the complete terms & conditions provided at the check in for more information. Q. WHAT IS THE CHARGE/CANCELATION POLICY? The down payment reservation deposit is non-refundable at any time. And cancelations made within 30 days or less of the arrival will result in a charge of 100% of your reservation. Q. WHAT WILL WE BE RESPONSIBLE FOR AT THE CHECK OUT? Q. HOW WILL I RECEIVE MY CONFIRMATION AND ARRIVAL INSTRUCTIONS FROM TBVH? The confirmation and check in instructions will be sent via e-mail. To be certain you receive these e-mails, please adjust your spam filter to add the domain tbvhomes.com to your list of accepted email addresses. You will receive a reservation confirmation after your down payment has been applied to the reservation, and check in instructions will be sent after the full payment of your reservation. The door codes, address and directions will be informed at the check in procedure only. Q. ARE THE POOLS HEATED? For homes with a private pool, TBVH offers pool heating for an additional fee of $35 per day, with a minimum of 3 days.When you book and pay for this option we will switch/turn on the pool heater on the day you arrive and turn it off on the morning you depart. A standard private swimming pool contains on average 10,000 gallons of water so heating it up is NOT instantaneous. The pool heater operates on a timer during the day and will generally raise the water temperature around 10 - 12 degrees per day and there will be some cooling off overnight when the air temperature drops. It's not unusual for a pool to a full day to reach its optimal operating temperature. Some homes provide pool covers - if yours has one then use it! They should be put on, bubble side down, whenever the pool is not in use. The cover helps to retain the heat in the pool and will assist you in getting the pool up to temperature as quickly as possible as well as helping to keep it there. Q. IS THERE AIR CONDITIONING AND HEATING IN THE PROPERTIES? All of our vacation homes have HVAC system – Heating, ventilation and air conditioning system. Please note that this is a central temperature system, which means that it can take up to a few hours to have the house fully heated or cooled. Q. IS THE KITCHEN FULLY EQUIPPED IN THE VACATION HOMES? Q. IS THERE A TELEPHONE AVAILABLE AT THE VACATION HOMES? Q. 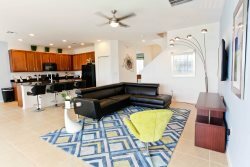 ARE THE VACATION HOMES CLEANED DAILY? No, our homes are cleaned before your arrival and after your departure. You can request a mid-stay clean at an additional charge. A mid-stay clean includes: cleaning all the bathrooms and the kitchen area, vacuuming and dusting, sweeping and mopping and making the beds (no washing of linens and towels included). Q. ARE THERE CLEANING SUPPLIES? We do not leave any chemicals in the home but there is a mop, broom, dustpan, vacuum, iron and ironing board in the property. All of our homes also include a washing machine, dryer and dishwasher. Q. ARE THE PROPERTIES NON-SMOKING? Yes, all of our properties are non-smoking. Smoking is ONLY permitted outside of the property with the doors closed to avoid the smoke to go inside of the house. Q. ARE THERE ANY HANDICAP ACCESSIBLE PROPERTIES AVAILABLE? Yes. Please contact our Reservation Team for a list of handicap accessible properties. Q. WHAT IF I WANT TO STOCK MY VACATION HOME RENTAL WITH FOOD AND SNACKS? There are a variety of supermarkets nearby to most vacation rental communities for guests who wish to have their favorite snacks and meals on-hand and in-home. We also offer our guests the option to order a Welcome Basket to be delivered prior to their arrival – this basket contains a few essentials and some amazing food to help you settle at the property without the trouble to go to a store first. For the ultimate in culinary convenience, guests may also request a personal chef to prepare their vacation’s meals from breakfast to supper, plate-ready and chilled in the refrigerator upon check-in. Q. WILL I HAVE INTERNET ACCESS AND CABLE TELEVISION? All of our vacation rentals are equipped with free wireless high-speed internet and cable Tv. The service is not under the control of TBVH and if any service interruptions or slowdown occur we cannot be held responsible. However, our team will ensure the service provider is aware and taking the proper actions regarding any eventual issues. During regular business hours you may call at 1-407-961-6700 and speak directly to one of our team members. All issues will be documented and addressed in a timely manner. To ensure your piece of mind, we additionally have a representative on-call to deal with any emergency situation within your vacation home property, outside business hours leave us a massage at 407-961-6700 - option 1 or send us an e-mail to [email protected].